The French championship final is one of the great rugby days of any year, but some inevitably come in time to be seen as more significant than others. The final played 100 years ago this Friday, on April 20, 1913, was unquestionably among the most memorable. Like many finals before 1914 it matched Paris with the provinces. SCUF, the club founded by Charles Brennus - whose name now adorns the trophy - in 1895, played Aviron Bayonnais. The match attracted a paying crowd of 20,000, a huge crowd in those days, to the Stade Colombes, while Henri Garcia records that a further 2,000 may have got in for free. Paul Voivenel, one of the most influential chroniclers of the French game, recorded that "The immense stadium was packed. All of the Southerners living in Paris were crowded together. There was singing in the sunshine". SCUF had more of a record at the top level of the French game. They had been losing finalists in 1911 and five of their players were already French internationals. Among them were Jules Cadenat, destined for a long career in rugby politics which would see him become president of Beziers and a national team selector and the Bayonne-born art dealer Jo Anduran, legendary for winning his single cap for France because the proximity of his gallery to the Gare du Nord made him the easiest substitute when an early squad pitched up one short for the trip to Wales. Bayonne were, as Voivenel recorded 'unknown only three years earlier'. As their name implied, they were the offshoot of a rowing club, whose members had decided as recently as 1906 that they needed another sporting activity to keep them fit through the winter. Among those rowers was Fernand Fourges, a national champion in 1905, competitor at the 1908 London Olympics and already a rugby player with neighbouring Biarritz. Together with his younger brothers Jean and Jules he helped establish the new Aviron rugby section and rapidly became ambitious for his club, dreaming, as Richard Escot and Jacques Riviere have put it 'of rugby which was more than just a game for good dribblers'. Escot and Riviere report that he found the means to this end on a trip to Wales, where he played for Penarth and persuaded local outside-half Harry Owen Roe to return to France with him to play, and to introduce the Welsh style of rugby which currently dominated Europe. That both brother Jules and Roe are listed as ship brokers on the French website devoted to their national finals suggests that Fernand, a motor trader, may have used family connections to provide Roe with a living. Arriving in 1911 Roe's ideas had an immense impact. Bayonne developed a style described by Escot and Riviere as 'a total rugby, in which everybody participated fully and in which the forwards were as skilled as the backs'. By the 1912-13 season, they were an all but irresistible force, scoring more than 600 points - an extraordinary number at this time - while conceding fewer than 100. In the qualifiers that took them to their final clash with SCUF, the tally was a still more imposing 171 points to 6. "The crowd chaired Bayonne's players off the pitch while former French captain Gaston Lane wrote in L'Auto (nowadays L'Equipe) that they had played with 'stunning brio, amazing audacity and, most of all, staggering skill'"
Nor were the Parisians any more capable of stopping Bayonne than opponents of earlier rounds. They were still just about in contention on the hour, when Bayonne led 13-3, but collapsed in the final quarter when the Basques added four more tries for a final score of 31-8. True to Fourges's dedication to 15-man rugby, six of the seven tries were scored by forwards - Eugene Elissalde crossing twice while both Jules and Fernand Fourges, Paulin Bascou and Jean Domercq scored, along with winger Victor Labaste. Roe landed four conversions. The crowd chaired Bayonne's players off the pitch while former French captain Gaston Lane wrote in L'Auto (nowadays L'Equipe) that they had played with 'stunning brio, amazing audacity and, most of all, staggering skill'. It was, in other words, a foretaste of the way the best French players and teams were to amaze and alarm opposing players and fans over the next century - far from the only French tradition, but the one for which they have been most recognised and admired. The result was a harbinger in other ways. While provincial dominance had been established over the previous decade, this was a hegemony of the major centres - Bordeaux, Lyon (which won in 1910) and Toulouse (1912). Bayonne were the first, but far from the last, small town winners. SCUF have never been near the final again, and nor was any Parisian team to hoist the Brennus until Racing Club in 1959. Bayonne reached the quarter-final again in 1914, going down to eventual winners Perpignan in a replay, a few days after a first meeting that would be famously recalled by Voivenel as 'the king of matches'. By the end of 1914, several of the players from that match were dead. 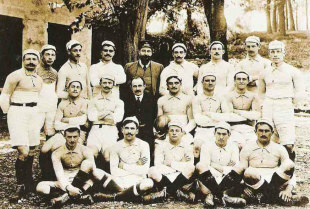 Five of Bayonne's victorious 1913 team died in the First World War, centre Jean Francois Poeydebasque and back rower Emmanuel Iguinitz falling on consecutive days in September 1914. Two SCUF players, including Anduran, died. The unfairness of the fate visited on war casualties can be seen in the way that many of the survivors would still have been around to drink a toast to the 50th anniversary of their final in April 1963. Fernand Fourges lost brother Jean in action in 1918 and Jules in 1919, but himself lived until 1973, adding a national championship in a third sport as a pelota player in 1926, 1927 and 1928 and helping train the Aviron team which brought the Bouclier back to Bayonne in 1934. Roe was still at the club in 1934 and for the best part of another two decades after that. As Jean-Pierre Bodis noted affectionately :"He came to learn French, and never really did in 40 years". But his contribution to Bayonne rugby is commemorated in the club's postal address at Rue Owen Roe. A young film-maker, Greg Harris, is working on a film about his life. As a key link in the process by which the Welsh game was transmitted to south-west France, but then transformed by players like Fernand Fourges into something distinctively French, his is a life well worth remembering.